Summer has come to Than, land of exiles and perpetual frontier - a country covered by primordial woods and the overgrown remnants of mighty civilizations. Vast and beautiful, it is also a land of lost colonies and ghost towns, where decade upon decade, hundreds mysteriously vanish without a trace. Yet for all its many dangers, Than's lure remains strong and draws new settlers every year, bleeding the Scarred Empire of those seeking adventure, fame, fortune, a better life - or simply somewhere to lay low, so that the world may forget their crimes. Enter our heroes... Young Lord-Paladin Marius Redstone, champion of arrogance and the people alike (who didn't get a say in the matter), and a team of professional mass murderers: one by cold-blooded tenacity, and the other by bloody accident. Craven, the Scarred Empire's most infamous monster hunter and his associate Echser, master alchemist and self-proclaimed greatest lover of science. For reasons that could not be any more different, these three find their fates merged as they seek to unravel a chain of mysterious murders committed by the legendary monster of the Gallowwood. The Woodmare. 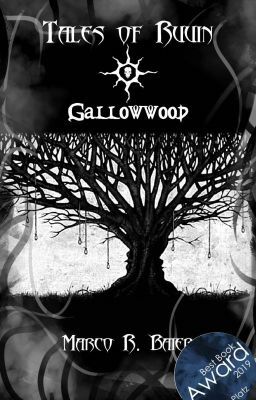 Yet in a world where not even the dead can be relied upon to rest, nothing is as it seems... ★★★★★★ Gallowwood is a stand-alone novel set in Ruuin, a gritty medieval fantasy world dotted with the remnants of a scientifically advanced civilization. A world in which the walking dead are just another natural catastrophe, and were ancient magic and technology lay waiting in the forgotten places of the world, eager for a rediscovery... The events of Gallowwood are set over a decade before my Harvest Wars Series. Furthermore, this book also contains the short story "Un-King" as well as the Novella "Seed of Evil" at its end, with Un-King playing before and Seed of Evil directly after the occurrences in Gallowwood. ★★★★★★ German Best Book Award 2019 - 🥉 Third place in "Dangerous Affairs"